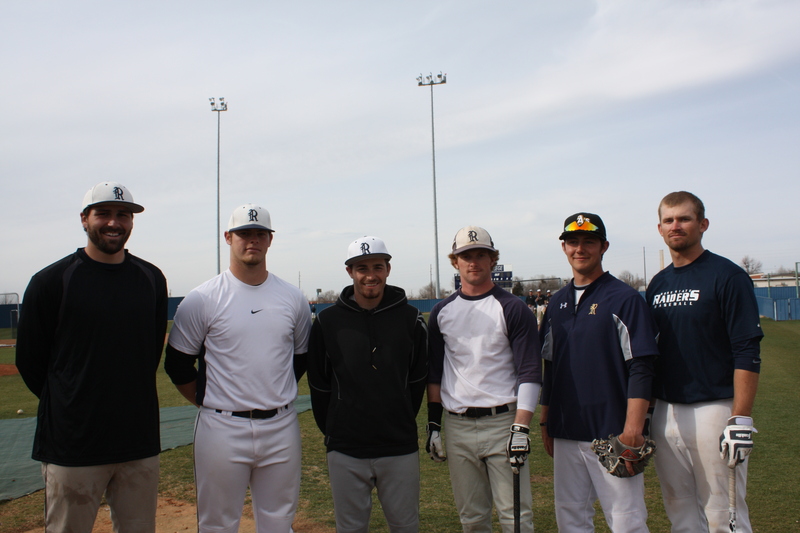 The men’s baseball team is in the middle of the 2013 spring season. The Raiders have played nineteen of their games with a record of ten wins and nine loses. The season has proved challenging, but the team is confident the stats will continue to improve. At the last faceoff against Hutchinson County, the final score of 0-7 did not accurately reflect the team’s ability and hard work. Raider Pitcher Chris Joiner led the stats with seventeen first pitch strikes and five strikeouts. The sophomore from Woodbridge, VA played a total of five innings. The double-header, March 12, against Seward County proved the team has what it takes to win. They dominated both games, which ended in final scores of 6-1 and 9-4. “We are really starting to play better now,” Head Coach Coty Cooper said. Cooper also announced two commitments from new players for the 2013-2014 season. Landon Eason, an outfielder from Yukon High School, and Jeremy Katz, an infielder from Fairview High School in Boulder Colorado. The team has fifteen sophomores on the roster this year, so more player commitments are expected soon. Rose State’s Garrett Crain, a sophomore infielder, has signed a commitment with NCAA Division I Texas Christian University. Crain came from Edmond Santa Fe High School and has played with Rose State for two years. The next home game is Tuesday, March 26 at 1:00 pm against Carl Albert State College. Admission is free to all students who show their valid student ID at the gate. The RSC Softball Team played two double-headers March 2 and 3. 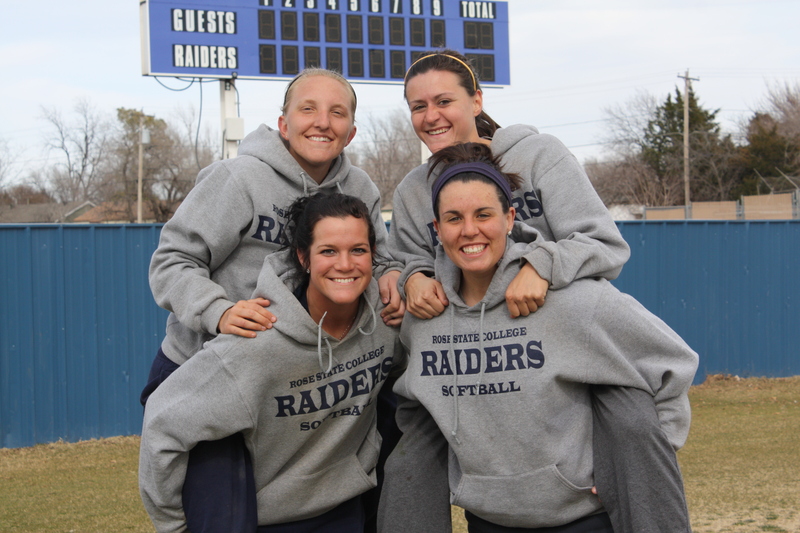 On Saturday, the Lady Raiders faced Eastern Oklahoma State College. They won the first game 9-1. The second game was slightly more challenging. The final score ended in a 5-6 loss. The team didn’t let that loss get them down and played Sunday’s double-header brilliantly. They won the first game 6-5 and the second game was a shut out with a final score of 7-0. “Cassidy Hart & Sherrena McPherson both had an exceptional weekend, both hitting 1 double and 2 homeruns apiece. Sherrena also pitched 12 innings, only allowing 6 hits, 1 run and she had 15 strikeouts,” said Head Coach Nickie Williams. The next home games are March 14 when the Lady Raiders take on Seminole State College and March 16 against Conners State College. The Lady Raiders will play double-headers both days with games starting at 2pm and 4pm. Admission is free to all RSC students who show their valid student ID at the gate. Courtney Moore and Rachel Cooper signed their letters of national intent on Thursday Jan. 17 to play for RSC softball. “We are very excited to add Courtney Moore and Rachel Cooper to the Rose State Softball Program. They each bring something different to the table; Courtney brings a lot of power while Rachel brings a lot of speed,” Nickie Williams, RSC head softball coach, said. The Duncan duo will be sticking together, soon to be trio when they join back up with former teammate Ashlee Perkins, who is a current pitcher at RSC. Moore and Cooper might be teammates and close friends, but they are completely different players on the field. Cooper is a slap-bunting center fielder, stealing 27 bases and battling .415 last season. Moore on the other hand, is a shortstop, power hitter, who hit eight home runs, has a 43 RBI(Runs Batted In) and a .548 batting average. “The fact that they will be joining their previous teammate, Ashlee Perkins, will be extremely beneficial, as they will have someone to help them develop into our program. Any time you can get athletes together who have been teammates before, it helps make the transition from high school to college much easier,” said Williams. The Duncan Lady Demons will have six players on college rosters next season and have had eight players sign softball scholarship in the past five years. Plainview High School senior Tiphani Napier is another new name to the RSC softball team; she also signed her national letter of intent in spring 2013. She owns her school’s single-season record for home runs and capped her season with a .453 batting average, seven home runs, 42 RBI and a .493 on-base percentage. The Wellness Center hosted their annual Ping-Pong tournament, Sept. 27 in the gym. “Its gives the students something fun to do, because it doesn’t involve teams, more for individuals it matters being at community college,” Chris Leland, the Health and Wellness Center Director said. The tournament was single elimination; best out of three, with total of ten participants signed up, including only one female named Ashley Jones. The prizes were awarded for first and second place winners. The competition was relatively close with all the players that participated. Sam’s/Wal-Mart gift card. The second place winner was Cade Cobble, who receive a $10 Sam’s/Wal-Mart gift card. Some upcoming events at Wellness Center is Treadmill-athon going on all of Oct. and Wii boxing event on Nov. 13-16. For more information, please contact Chris Leland at 733-7350. The RSC baseball and softball teams hosted a family night on Sept. 21 at the fields. According to softball coach Nickie Williams, both teams had an event filled night. The softball team had an intrasquad scrimmage from 3-5 p.m. while the baseball team had its regular practice. Both teams and their guests were then invited to participate in a homerun derby. There were a total of 15 participants, of all ages. Each participant was given ten swings to see how many they could hit out. Assistant softball coach Travis Murie won by a score of six out of ten. The evening ended with snacks for everyone who attended. “It was a great turnout and everyone had a great time,” said Coach Williams. The softball team has three upcoming games in October. Oct. 6 at 10 p.m. sees them face East Central University in Ada. On Oct. 12 they play Cameron University in Lawton at 2 p.m. and on Oct. 13 they play St. Gregory’s University in Shawnee at 2 p.m.
Students played volleyball at their first meeting on Aug 30. With the new school year now in full swing, everyone needs a break from studying, and playing sports is a great outlet from the books. The Recreational Sports Association, RSA, is a great opportunity to get involved on campus and get active and is a lively club that offers a stress-free environment.